Give to the Wheat | …What Nourishes His Heart Is Not What He Gets From The Wheat, But What He Gives To The Wheat. Rice porridge is a staple food all across Asia, though probably China and Japan are most known for it. It is a great dish to know how to make for a couple of reasons: you can put anything you want in it, and it’s one of those warm, comforting foods that is great for rainy days and runny noses. It kind of fills the niche of both chicken soup and oatmeal. Since the rice is cooked until very soft, it is often served to people who are sick, since it is easy to digest, but it is delicious regardless of your state of health. It is easy to make with some meat, or to make vegetarian or vegan, just depending on what you want. When we cook dishes that are served with rice and we have leftover rice, we wrap it in plastic wrap and stick it in the freezer just for the purpose of making rice porridge. You can then just pull some out, unwrap it, stick it in the pot with liquid, and heat it up. It’s hard to judge ratios of rice to liquid this way, but in the end it doesn’t really matter that much. If you’re using pre-cooked rice, you want about twice as much liquid as rice to start with, but you can always adjust as it cooks and add more or cover the pot if you don’t have enough liquid, or remove the lid to let liquid cook off if you have too much. This rendition just happens to use a number of things we had in our fridge that needed to be used, and it turned out really delicious. Try to find the same ingredients, or just use what you have at home and make up something new. The same basic principles we state below will give you a good starting point to experiment from. Place the cooked rice in your pot, and add maybe 3/4 of the stock. Turn on the heat to medium-high. 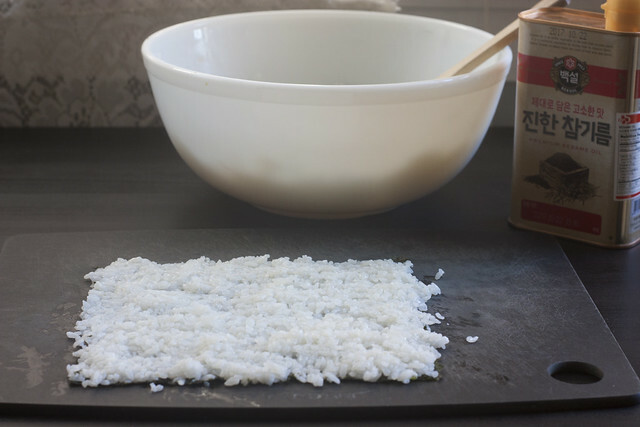 If you’re using frozen rice, let it defrost and break apart. Once the rice is all broken up and the stock is steaming, reduce the heat to low, and start adding other ingredients. Add the minced ginger and garlic first. Next, start adding ingredients that take longer to cook, like the carrots and sausage in this case. Add salt and pepper to taste. Let those ingredients cook for a while with the rice and stock, adding a little more stock periodically if need be, to maintain the desired texture of the porridge. Be sure to stir regularly, so the rice doesn’t stick to the bottom of the pot. Once those ingredients start to soften/cook, add other ingredients that don’t take as long to cook, like the mushrooms, turnips, and any sturdier greens you may have (the komatsuna in this case). Once everything is nearly finished, add anything you don’t want to cook very long – delicate greens (the turnip greens) and green onion in this case. Taste for seasoning, add anything you think it might need, and then serve it up in bowls, steaming hot! One of our favorite things to do on weekends is to sleep in late, then get up and cook something delicious, make a pot of coffee, and have a nice, relaxed mid-day before we do anything serious. This weekend we were looking through recipes we wanted to try, and this just happened to only include ingredients we had already in the apartment, so we decided to give it a try. That was a good choice. This dish is bright and spicy, with some smokiness from the smoked paprika, richness from the eggs, and goes perfectly with dense, toasted bread. Pile it on the toast and eat it like an open-faced sandwich, or serve it beside and dip the bread in. We basically followed this recipe from Food52.com, with the addition of smoked paprika. Serves 2 people with a nice, hearty breakfast – and if you only like a moderate amount of the tomato sauce, you may have enough left over to cook another egg or two in the next day. In a deep-sided skillet or frying pan with a lid, heat butter and olive oil together over medium heat until hot. Sauté onions for about 5 minutes until they turn translucent and start to brown and caramelize a bit. Add garlic and jalapeño and sauté for about another minute. Add crushed tomatoes, hot sauce, bay leaf, and smoked paprika. Bring the mixture to a boil, then reduce to a steady simmer and let simmer, uncovered, for 20-30 minutes until sauce thickens. Using a spoon or spatula, make four small depressions in the sauce, and crack your eggs right into those depressions. Season the eggs with salt and pepper and then cover the pan to cook the eggs until the whites are solid and the yolks are however you like them. Once the eggs are done, serve them up with sauce and bread, and dig in! Continuing on our recent trend of cooking a lot of Japanese food, here is a classic. 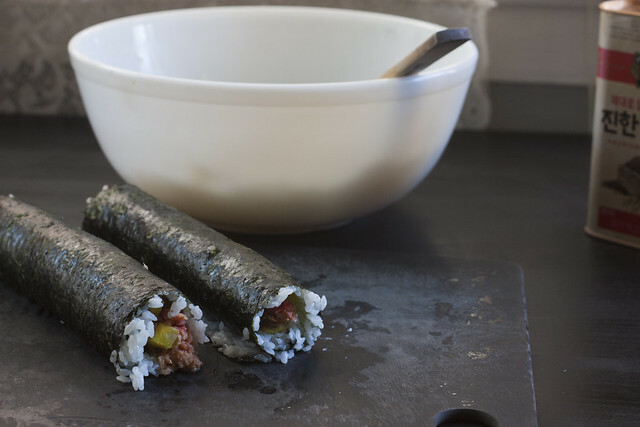 Onigiri are rice balls (or maybe more specifically, compressed rice with filling in it). They can be made in many shapes, and with many fillings (or just plain with salt). They can be shaped by hand, or using a mold. They are a convenient food to make ahead of time and then take with you somewhere, and they are pretty and pleasant to eat. Because you can fill them with almost anything, they are also very diverse, and can be made sweeter, more savory, or salty and pickled, depending on how you’re feeling. 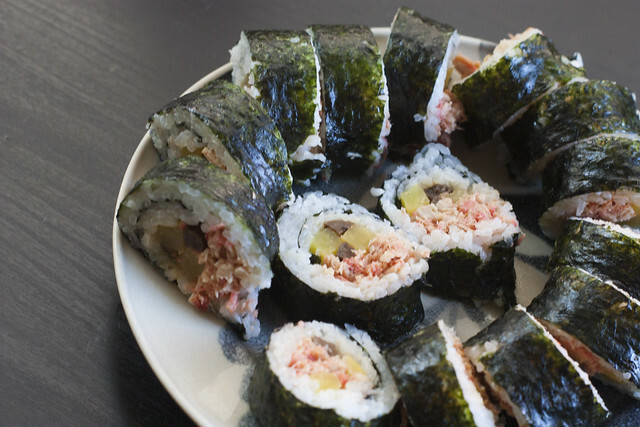 They are often wrapped with a piece of nori (seaweed) on the outside, both for aesthetic purposes, and to allow you to hold the onigiri without the rice sticking to your hand. For ours, we were just using what we had on hand. We had used some katsuobushi recently to make a somen noodle dipping sauce, and that involved soaking the katsuobushi in soy sauce, mirin, and some other things, so we strained out the katsuobushi, squeezed it out, and kept it for filling. 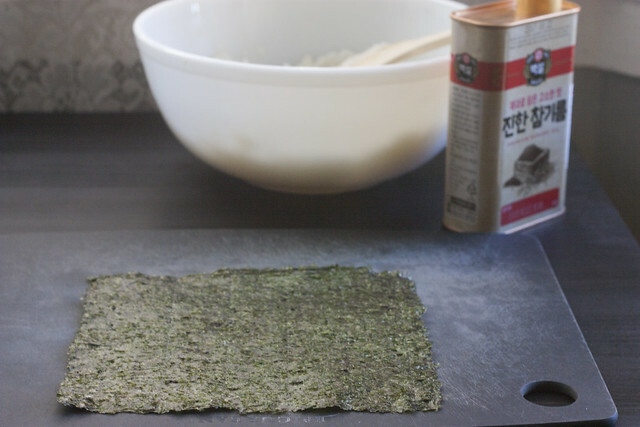 We didn’t have any nori on hand, though I do usually prefer wrapping a small piece around the onigiri. We did have some nanami togarashi (a ground spicy pepper and sesame seed mix), so I used that to decorate the onigiri, and provide a little extra zing when eating them. Other fillings we have used in the past include miso paste and pickled vegetables, miso pork and pickled ginger, and ginger chicken, but really you can put anything in there that will fit. Soy-soaked shiitake mushrooms chopped finely would be delicious. Any other cooked and chopped vegetables would be nice. Other types of dried or cooked fish could also be good. The process is very simple. You just need rice and filling. For six onigiri (using the mold we have), I made 2 cups of rice. If using a mold, moisten the inside, and press enough rice in the bottom to fill it up about halfway, then press a divot into the center. If doing it by hand, moisten your hands, and take a large bunch of rice in your hand, and press a divot in the middle. Fill up the divot with filling. 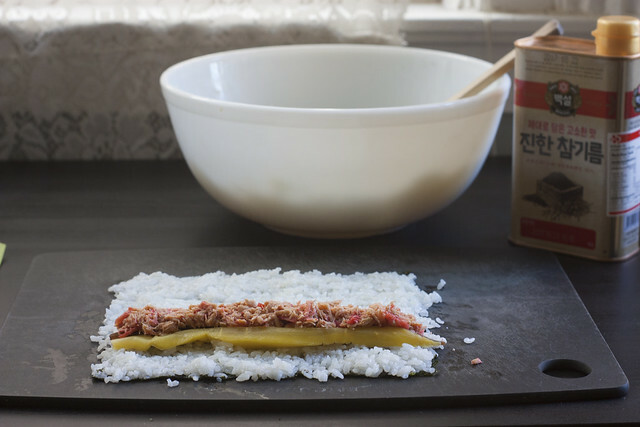 If you’re doing this by hand, roll the rice around the filling, and then form it into whatever shape you like. If using a mold, press more rice in on top of the filling. 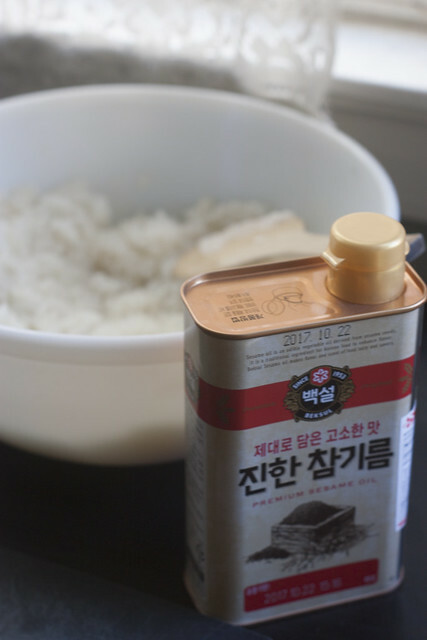 Then press the top of the mold in firmly but gently – not enough to smash the rice, but enough to press it together. Tip the mold upside-down, and squeeze the onigiri out. Now, no matter whether you’re doing it by hand or using a mold, decorate your onigiri using nori, togarashi, sesame… whatever you like. And that’s it. Let them cool so that the rice kind of congeals and sticks together well, then wrap them up and take them away, or eat them then and there.